The Fokker C.IV was a 1920s Dutch two-seat reconnaissance aircraft designed and built by Fokker. The C.IV was developed from the earlier C.I but it was a larger and more robust aircraft. The C.IV was designed as a reconnaissance biplane with a fixed tailwheel landing gear and was originally powered by the Napier Lion piston engine. It had a wider fuselage and wider track of the cross-axle landing gear than the C.I. The last flying example of a C.IV is a C.IVA preserved at the Owls Head Transportation Museum in Owls Head, Maine. It was used in a trans-Pacific attempt in the late 1920s or early 1930s. They took out the seats in the passenger compartment and installed a large fuel tank. They also put a small cockpit just in front of the vertical stabilizer with a hand-powered fuel pump inside. In flight, the crew member sitting there would transfer fuel to the main tank in the wing, where it would be fed by gravity into the engine. In this trans-Pacific attempt they planned not to go straight across the Pacific but up the West Coast of North America to Alaska and down the chain of Aleutian Islands, proceeding down the Chinese coast to Tokyo. 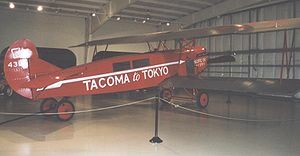 They took off from Tacoma, Washington and started to head north, but made it about 100 miles of the way to Vancouver, British Columbia when the engine vapor locked and forced a landing in a field. They had to dump most of their fuel to bring down the weight in order to take off from the field. When they got back in the air, they started heading for the national airport to top off the tanks, but they crashed upon landing and decided to give up. They loaded the C.IV onto a Ford flatbed truck and brought it back to Tacoma. It sat until 1970, when one of the museum's trustees found it and restored it and donated it to the museum. It flies to this very day. Production version with a 336 kW (450 hp) Napier Lion engine. As C.IV but using a Rolls-Royce Eagle or American Liberty engine. Long-range reconnaissance version with extended wingspan (14.27 m/46 ft). Extended wingspan as C.IVC and fitted with twin-floats and Napier Lion engine. Special version for a flight between Amsterdam and Tokyo in 1924. United States Army designation for three aircraft for evaluation. United States Army designation for five production aircraft powered by 313 kW (420 hp) Liberty L-12A engine and fuselage extended by 24 cm (9½ in).